Hundreds of changes in the 2017 edition NEC® bring you up-to-code and ready to address new sources of electrical power. Throughout the United States and around the world, NFPA 70®, National Electrical Code® (NEC) sets the foundation for electrical safety in residential, commercial, and industrial occupancies. The 2017 edition of this trusted Code presents the latest comprehensive regulations for electrical wiring, overcurrent protection, grounding, and installation of equipment. NFPA 70, NEC has been published since 1897, and a rigorous process of review keeps it up-to-date with new technologies. In fact, more than 4,000 public inputs and 1,500 comments went into the 2017 NEC alone. Hundreds of updates and five all-new articles pave the way to a safe and efficient electrical future. Major additions reflect the continuing growth in renewable power technology. The newest NEC addresses the advancement of privately owned wind and solar power generation and distribution equipment -- including coverage of higher voltage systems that were once only the utilities' domain. The new consumer role is a major factor in energy decentralization, and expanded NEC coverage is vital for designers, engineers, contractors, and AHJs. Large-Scale Photovoltaic (PV) Electric Power Production Facility (New Article 691) covers systems that produce at least 5 megawatts (MW) of power, or enough to power 800+ U.S. homes. Energy Storage Systems (New Article 706) governs ESS installation, disconnection, shutdown, and safety labeling. Stand-Alone Systems (New Article 710) covers power production sources that are not connected to the grid, including PV and wind-powered systems. Direct Current Microgrids (New Article 712) concerns independent energy distribution networks that allow the utilization of power from dc sources to direct-current loads. Microgrids are on the rise worldwide. Other NEC revisions protect the public and workers from deadly hazards. New labeling, such as detailed arc flash hazard warning on equipment, helps workers and supervisors assess electrical risks. New minimum space clearances for equipment installation clarify the safeguards needed to protect installers and maintainers. Fixed Resistance and Electrode Industrial Process Heating Equipment (New Article 425) presents needed regulations for industry. Revised provisions for AFCI and GFCI protection improve electrical and fire safety in homes. Be prepared to protect lives and property in the ever-changing electrical landscape. Order the 2017 National Electrical Code. Interested in other editions of the NEC? Use the drop down menu above to select the edition year you need. Preview sample pages from the 2017 NFPA 70®: National Electrical Code® (NEC®). NFPA 70®: National Electrical Code® (NEC®) is the basis for electrical safety that has saved countless lives. Adopted in all 50 states, the NEC helps protect people and property from electrical hazards involving wiring and equipment. Comprehensive provisions address electrical installations in virtually all buildings -- including commercial, residential, and industrial occupancies. Revisions to the NEC are industry-driven, based on public proposals and comments. Each editio n of the Code builds on the next, through consensus-based changes that reflect the evolving needs of the field, emerging technologies, and new information about electrical safety. 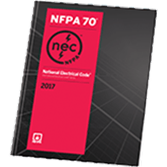 The 2014 edition of NFPA 70: National Electrical Code responds to a changing world with new requirements addressing the emerging use of DC power in many applications, and new information about reducing electrical fire and shock hazards. Four added Articles expand coverage on growing technologies, including Low Voltage Suspended Ceiling Power Distribution Systems (Article 393); Modular Data Centers (Article 646); Fire Resistive Cable Systems (Article 728); and Energy Management Systems (Article 750). Other new or revised requirements enhance protection of electrical personnel from the risks of shock and electrocution, such as centralized locking requirements and revisions dealing with field marking of equipment and hazard warning labels. The 2011 NFPA 70: National Electrical Code advances to meet the increasing consumer demand for alternate energy, green technologies, and IT equipment. New Article 694 presents requirements for small wind electric systems and new Article 840 addresses the increased demand for broadband communications systems with requirements for wireless, routers, and wireless disconnects. Other changes include revised Article 625 with updates on safe battery charging for plug-in hybrid vehicles; and revised Article 705 with guidance on interconnecting generators, windmills, and solar and fuel cells with other power supplies. The 2008 NFPA 70: National Electrical Code works to improve public safety, emergency preparedness, Code usability, and worker protection. New Article 708 covering Critical Operations Power Systems (COPS) presents provisions for electrical security in public and private facilities that must stay online during a crisis, such as public safety dispatch centers and hospital ICUs. Because arcing faults on wiring systems and extension cords can cause home fires, the 2008 NEC expands AFCI use to living areas. New rules for tamper-resistant receptacles respond to the CPSC's National Electronic Injury Surveillance System (NEISS) reports that thousands of children are treated in hospitals every year for burns received as a result of inserting objects into receptacles. The 2005 NFPA 70: National Electrical Code expands requirements for ground-fault circuit-interrupters (GFCI) to help ensure the use of these potentially life-saving devices in homes, businesses, and public spaces. New Article 409 introduces rules for industrial control panels, new Article 506 presents a zone hazardous area classification system for combustible dusts and ignitible fibers and flyings, and new Article 682 covers natural and artificially made bodies of water not classified as swimming pools or fountains. In addition, new Article 353 is added for installations using HDPE conduit. The 2002 NFPA 70: National Electrical Code adds provisions for installing surge-protective devices in new Article 285. Other key revisions in this edition include a one-stop Article 406 that improves user efficiency when handling receptacles, cord connectors, and attachment plugs; Article 692 with access rules covering fuel cell systems; and a parallel numbering systems for Raceway and Cable Articles in Chapter 3: Wiring. The 1999 NFPA 70: National Electrical Code introduces new Article 490 with general guidelines for high-voltage installations, and new Article 830 with added NEC requirements impacting telecommunications installations. In addition to numerous technical changes, it's also the first NEC Codebook printed in an 8 1/2 x 11-inch size with more legible type and expanded tables. Boost your referencing power with NFPA®'s best-selling NEC® Tabs for your NEC Code or NEC Handbook. Invest in this easy way to save time on every electrical job. Self-adhesive NEC Tabs affix to the edition your copy of NFPA 70®: National Electrical Code® or NEC Handbook, so you can flip open your book to the latest electrical safety information. Plus 4 blank Tabs you can customize! Maximize time at work with NEC Tabs! What are NEC Reference Cards? All-new NEC® Reference Cards provide fast and easy access to the most essential NEC tables for electrical contractors and installers. Keep installations right on the money with 13 frequently referenced NEC tables printed on durable waterproof NEC Reference Cards. Based on the 2017 edition of NFPA 70®: National Electrical Code®, double-sided Reference Cards are lightweight and compact enough to fit into a pocket. They also easily attach to your belt or toolbox using the 1" ring-clip (included). Carry all the cards or just those you need on a particular job. TABLE 310.15(B)(7) Conductor Sizes for 3-Wire, Single-Phase Dwelling Services and Feeders.